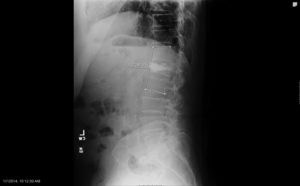 68 yo woman with L1 osteoporotic fracture and kyphosis - Matthew D. Hepler, M.D. 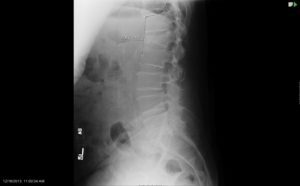 Case review: 68 yo woman with osteoporotic compression fracture treated for 3 weeks with bracing. She had persistent back pain with kyphosis (hunchback) which progressed to 22 degrees. Patient was treated with minimally invasive kyphoplasty under local anesthesia with correction of her kyphosis to 13 degrees and resolution of her back pain.